Welcome and thank you for choosing Alpine Family Dental! It is our goal to assist you in obtaining and maintaining dental health. We wish to make your visit informative; Dr. Eller will examine your teeth, perform an oral cancer exam, review necessary x-rays, make an assessment of your oral condition, and discuss his findings with you. 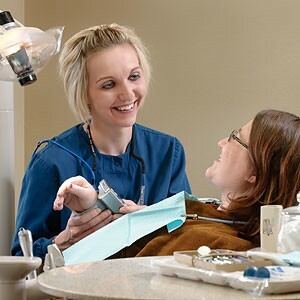 You will meet several of our Team members who will assist Dr. Eller in completing your oral health evaluation. To the right you will find a link to printable forms to be completed at your convenience and brought to your appointment. It is our policy to collect the patient portion fee at the time of service. Patient portion fees can include your deductible and any co-insurance amounts not covered by your policy. You have the option of paying with cash, personal check, or credit card (Visa, MasterCard, Discover, and Patient Financing Plan). We offer application assistance with Care Credit for intended use in our office. Your time is valuable as is ours. If you are unable to keep your scheduled appointment, please provide us at least 48 hours notice. We will happily reschedule your appointment. You will find that we are dedicated to excellence in patient care. We look forward to meeting you!